The S&P Case-Shiller national index reports that prices dropped a record 18.2% in the final three months of 2008. NEW YORK (CNNMoney.com) -- Home prices declined at a record pace around the nation in the final three months of 2008, according to an industry report released Tuesday. The S&P Case-Shiller National Home Price Index reported that prices sank a record 18.2% during the last three months of 2008, compared with the same period in 2007. In a separate release from the government, the Federal Finance Housing Agency (FFHA) reported that prices on its home purchase index fell 8.2% during the quarter on a year-over-year basis, and 3.4% compared with the third quarter of 2008. The government index, which used to be known as the OFHEO home price index, differs from the S&P Case-Shiller index in that it only compares sales of homes that are purchased with so-called "conforming loans", ones guaranteed or bought by mortgage giants Fannie Mae and Freddie Mac. Homes purchased without financing or ones too expensive to qualify for a Fannie-Freddie loan are not counted in the FFHA statistics. The decline does not seem to be slowing - just the opposite. The average home price dropped 2.5% between November and December in the 20 top metro areas. That was a larger increase than the 2.3% drop a month earlier. "The deterioration in U.S. home prices continues apace, with the rate of decline picking up steam late last year," said Mike Larson, an analyst with Weiss Research. "Rising foreclosure activity is putting pressure on prices, as lenders are increasingly pursuing a 'take what we can get' selling strategy." Karl Case, the Wellesley economist who, with Yale economist Robert Shiller, co-developed the index, pointed out during a news conference following the index's release that the markets experiencing the steepest falls also enjoyed the biggest run-ups during the boom. 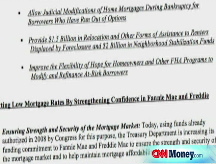 "Those markets were driven by subprime lending expansion from the summer of 2003 on," he said. "After the [Federal Reserve's lowered interest rates] to fight against the recession of 2001, subprime took off like gangbusters." Sun Belt cities suffered the worst declines, with Phoenix down 34%, Las Vegas off 33% and San Francisco lower by 31.2%. Denver fared best, down 4%, while Dallas was lower by 4.3% and Cleveland slid 6.1%. Of the nation's three largest housing markets, New York home prices dipped by 9.2%, prices in Los Angeles dropped by 26.4% and Chicago prices declined 14.3%. Despite the drop in home prices, which has given affordability a big boost, the pace of home sales continues very weak. Existing homes have been selling at an annualized rate of fewer than 5 million, down more than 40% from the peak. New home sales, at an annualized rate of about 331,000, are at their lowest level since the Census Bureau began keeping records back in 1963. The worst may be yet to come, according to Peter Schiff, president of Euro Pacific Capital, an investment firm specializing in overseas investments and a noted bear on home prices. "Prices are going to continue to fall," he said. "They have to reflect economic reality." That reality includes stock prices down to their lowest level in nearly 12 years. "Where would real estate prices be if they went back to where they were 12 years ago?" said Schiff. The index statistics do not contain a lot of good news for the future, according to Case. "We'll learn more in the spring market," he said. "Sales should pick up and we'll begin to see how well the president's program is working. There's no evidence in the data to tell us that home prices will bottom out."